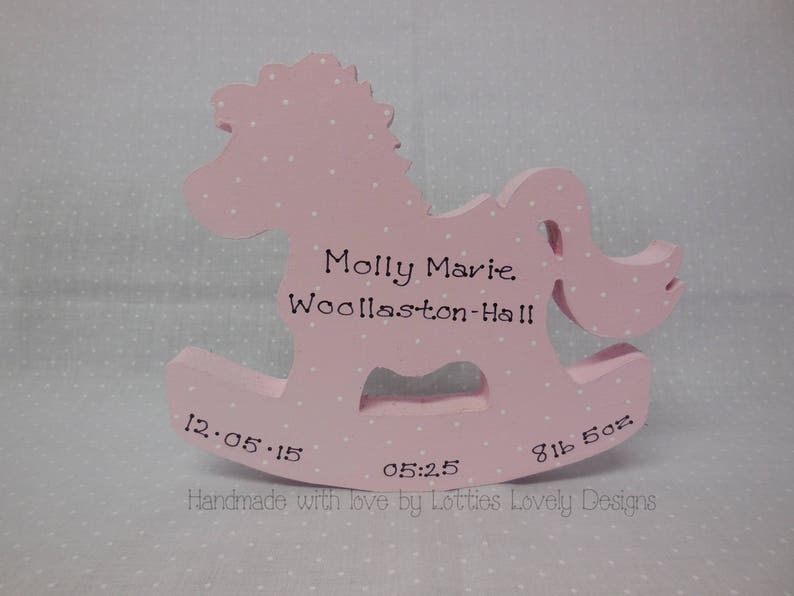 Made from thin 18mm MDF this inc cut & hand painted birth announcement rocking horse would make a great addition to a nursery shelf once new baby arrives. Comes with hand written birth details & contrasting white dots. The Rocking Horse is 15cm tall & made from 18mm MDF so freestanding & no need for fixings. Painted in any pastel colour of your choice, I have listed some popular colours however if your choice is not listed please message me as I'd be happy to meet your requirements. **Any missing pieces of information then I will contact you to check once, if no reply is made it will be assumed you want this information missing from the plaque & it will be made with only the information given.